A gun? Or something more? Developers at Rockstar Games might have added their own reference to the recent conversation surrounding Rockstar's labor practices directly into Red Dead Redemption 2. Sleuths online might have found a hidden reference to Rockstar's overtime and crunch in a cheeky gun ad found near the start of Red Dead Redemption 2, which you can find thanks to Rockstar's meticulous attention to detail. Inside the Cattleman Revolver gunsmith catalogue you can find an ad for The Buck Original (on sale for $45). 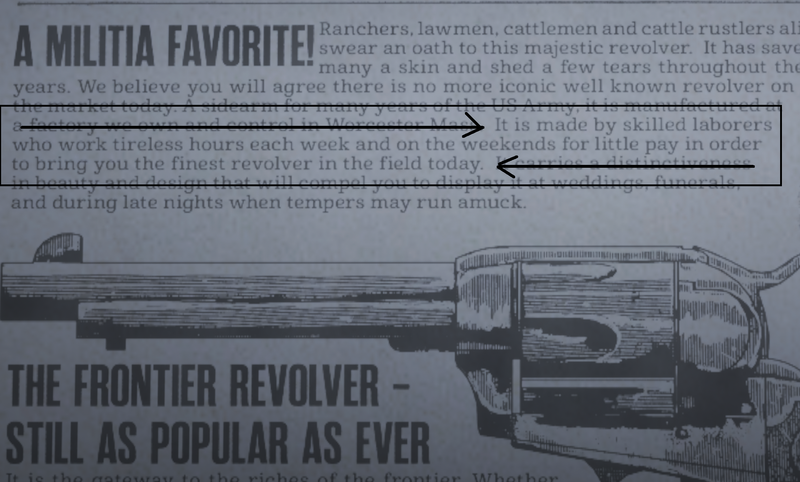 Within the longer description is this little tidbit: "It [the gun] is made by skilled labourers who work tireless hours each week and on the weekends for little pay in order to bring you the finest revolver in the field today." Eurogamer pointed out that the factory in which this gun is made is in Worcester, Massachusetts a real city right next to Andover, Massachusetts, the site of Rockstar's New England studio that's been working on Red Dead Redemption 2. Coincidence? Maybe, but the overwork and the low pay suspiciously mirror with what we've heard about Rockstar during the development of Red Dead Redemption 2. The reference, while not confirmed, would match with a series of reports from the past weeks about the intense working conditions at Rockstar Games. Long hours, seemingly mandatory overtime, and more have led to developers speaking out about working at Rockstar. While Red Dead Redemption 2 is now available, questions remain in the games industry about how intense game development effect employees.